﻿International Day of Forests: Calendar, History, Tweets, Facts, Quotes & Activities. International Day of Forests seeks to celebrate forests while providing a platform to raise awareness of the importance of trees. The day also raises awareness of rapid deforestation and educates about the vital role that forests and trees play in sustaining and protecting humans by supplying us with freshwater and oxygen. In fact, forested watersheds and wetlands provide the world with nearly 75% of its accessible freshwater. International Day of Forests was declared in December 2012 by the United Nations General Assembly in an effort to promote the importance of forests to humans and aid in conservation efforts. 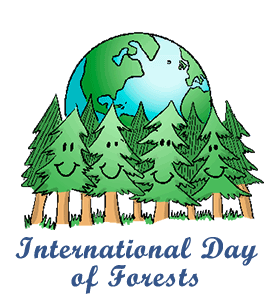 International Day of Forests is observed annually on March 21st. Since then, International Forest Day has become one of the most influential global events advocating for forest conservation in the world. The theme for International Day of Forests 2019 was "Forests and Education". Forests that are managed in a sustainable way contribute to education and the aim is to show this. The theme for International Day of Forests 2018 was Forests and Sustainable Cities. Nearly one-third of the world's largest cities get their drinking water directly from protected forest areas. Forests act as natural filters for water by removing particles from it such as metals and nitrogen. According to the UN, approximately 1.6 billion people worldwide depend on forests for their livelihood. Join the celebration of the International Day of Forests and World Water Day in the Economic and Social Council Chamber of the UN. Every year they host a meet and greet style event in the chamber that the public can join in on. Watch a movie that advocates for the protection of forests or showcases their rich biological diversity. Some of our favorites are Planet Earth , FernGully: The Last Rainforest , and Wild . Spread awareness on social media by using the hashtags #InternationalDayofForests, #SavetheForests or #IntForestDay. Share your favorite photo of a forest or plant with the Food and Agriculture Organization of the UN by emailing it to idf@fao.org. The UN will add it to a combined gallery of everyone’s pictures around the world! Read a book that is advocating forest conservation. Some of our favorites are: The Sibley Guide to Trees , The Wild Trees: A Story of Passion and Daring , and Forest Ecology .